As the night set in, we walked from our hotel to the 25th August Street. 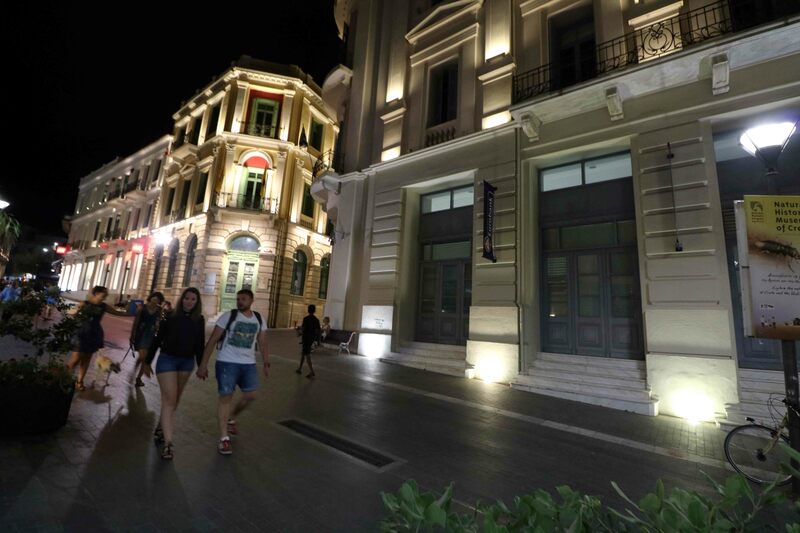 It is now a paved pedestrian street, and boasts the most beautiful Neoclassical buildings that house banks, travel agencies and tourist shops. 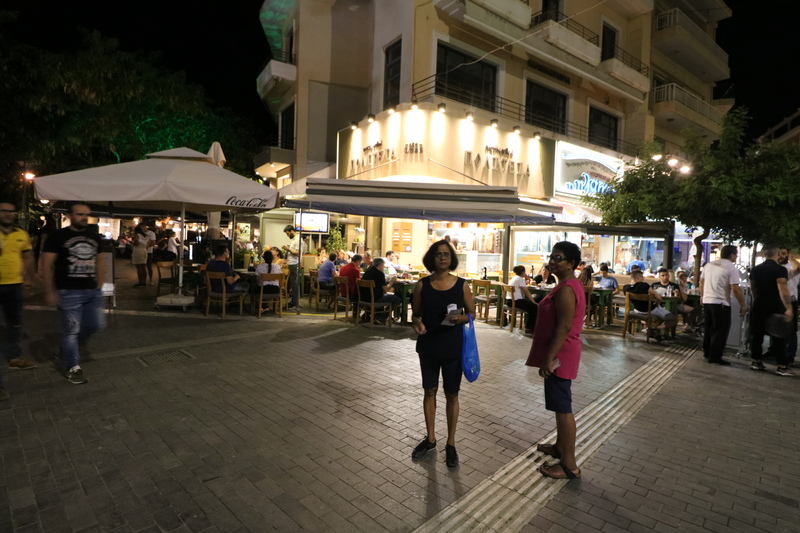 This street may have been first cut by the Arabs in the 9th or 10th century, the main thoroughfare of Heraklion, linking the town centre to the harbour. During the Venetian period it was called the Ruga Maistra (Main Street), while in Ottoman times it was known as Vezir Tsarsi (Vizir’s Market) after the Vezir Mosque. The modern name of the street relates to a tragic event. On the 25th of August 1898, during the feast of St Titus, fanatic Muslim mob slaughtered many Christians, including 17 British soldiers and the British Consul. Walking down the street, we came to the Lions Square. It holds the ornate Venetian fountain of four lions with water gushing from their mouths. 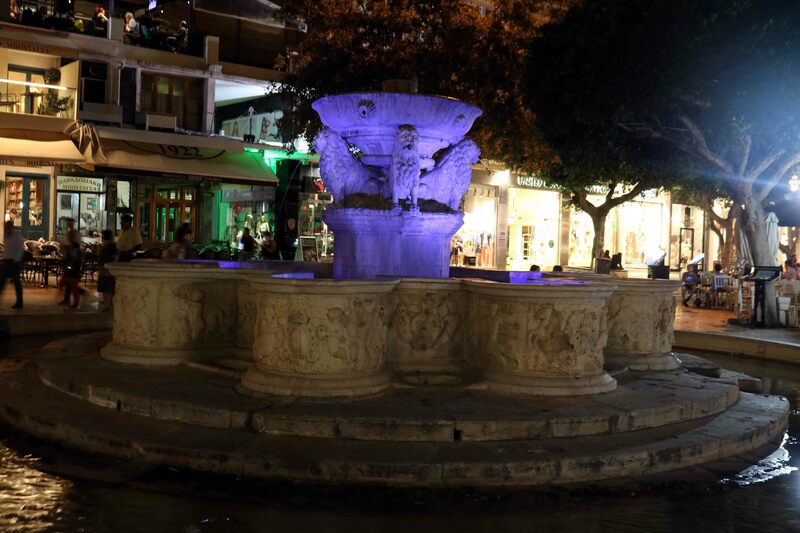 The fountain is officially in ‘Eleftheriou Venizelou’ Square in the centre of Heraklion, but the inhabitants of the city never use the official name, usually referring to it as the Lions Square or the Lions for short. The Venetians built it in 1629 as a solution to the problem of supplying Heraklion with water, providing 1,000 barrels of water a day. Opposite the Lions Square is one of the first and most important works of the Venetian settlers, the St Mark Church. Next to the church on the South-West corner was a high bell tower with a clock. During the long Turkish siege of the city, the bell was used as a bomb alarm, resulting in the bell tower becoming the target of the Turkish cannons. When the Turks took over the city, the church was converted into a mosque. The bell tower was demolished and in its place they built a minaret. Restoration of the building commenced in 1956 and today it houses the Municipal Art Gallery. Down the street is the Loggia (noblemen’s club), constructed in 1626-28 AD by Francesco Morosini, the same man who built the Lions Fountain. This is the fourth and final Loggia built during the period of Venetian rule. Very little information is available on the first three. 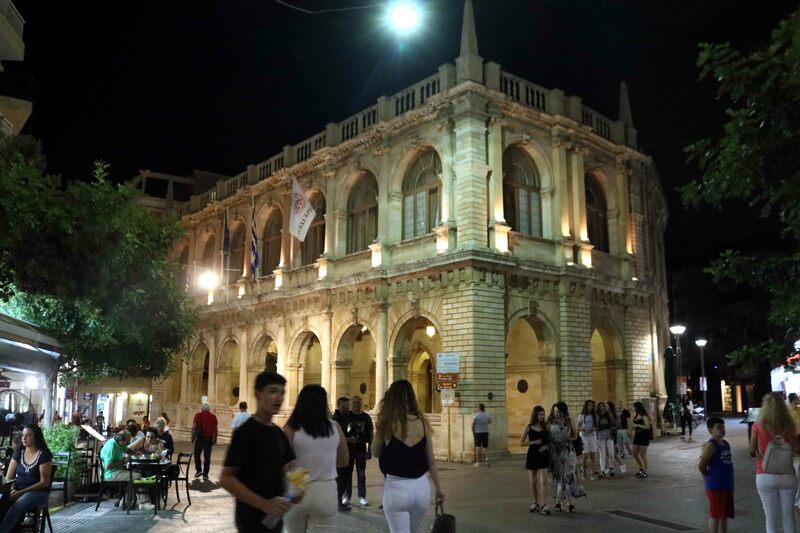 Venetian political and social customs demanded the construction of a public building in Heraklion, as a meeting-place for the nobles, rulers and feudal lords, where economic and commercial decisions were made. It was also a place for them to relax. 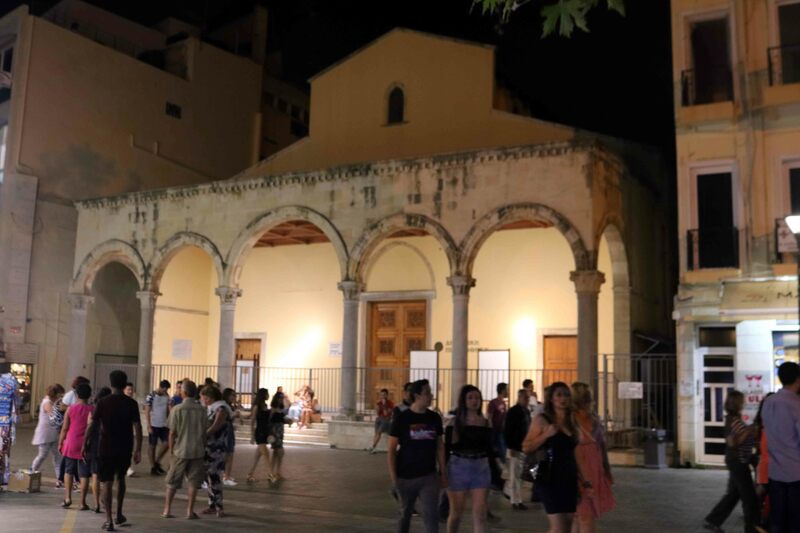 The building is a faithful reproduction of Palladio’s famous Basilica in Vincenza, demonstrating the significance the Venetians attached to the city of Heraklion. . Today the Loggia has been restored to its former glory and houses the Town Hall. In 961 AD, the Arabs were driven out from Crete, bringing the island back under Byzantine Empire. 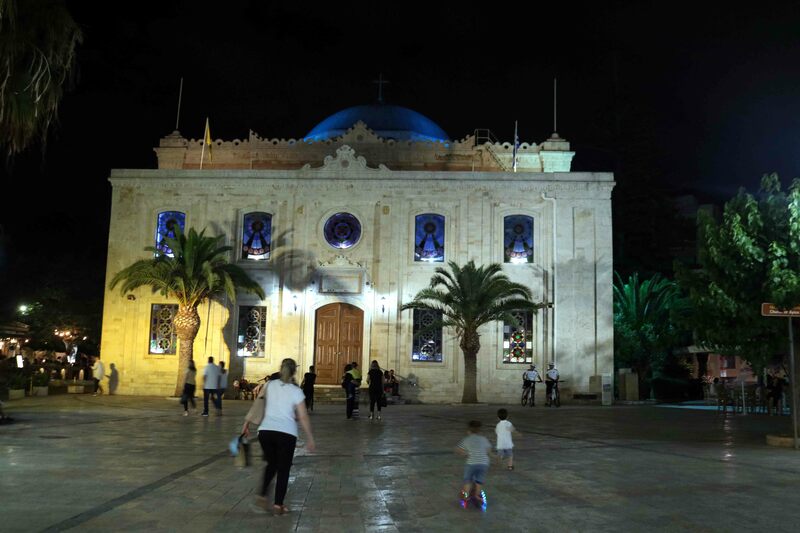 This is when the first Orthodox church of St Titus (Agios Titos in Greek) must have been built, to rekindle the Christian faith and tradition in Crete, which had declined due to the Arab conquest of the island. Saint Titus was a disciple of the Apostle Paul and the first Bishop of Crete. At the fall of Heraklion to the Turks, all relics were removed to Venice, where they still remain today. The single exception is the skull of St Titus, which was returned to Heraklion in 1966 and is now kept in a silver reliquary in the church. During the Turkish rule, the church was converted into a mosque known as the Vezir Mosque. The great earthquake of 1856 totally destroyed the church. It was rebuilt in its present form as an Ottoman mosque. The minaret of the church was demolished in the 1920s, when the last Muslims left Heraklion The church was further modified in 1925. 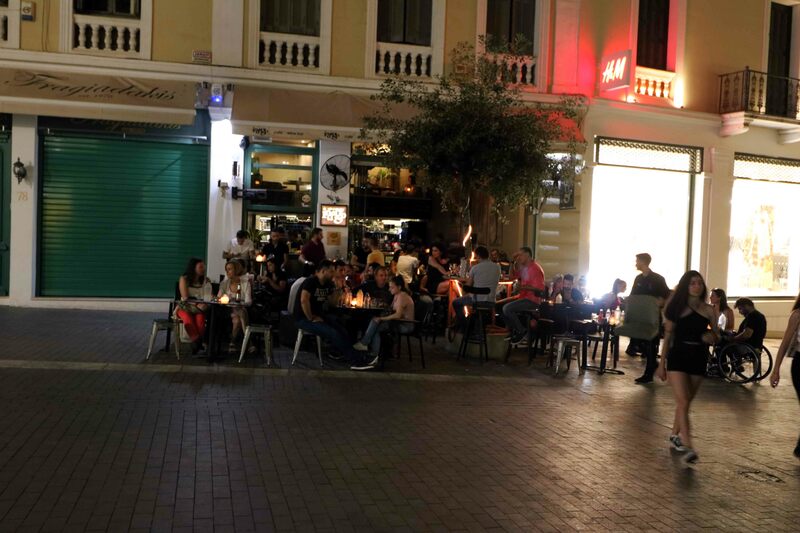 Heraklion, a city well known for its intense and vibrant nightlife, offers many a chance for a night out. The night entertainment consists of modern and traditional spots to choose from. There is an interesting variety of bars and clubs and they stay open till 3 o’clock in the morning. These bars play lounge or loud music and on some live bands perform. Many taverns host bands which play live traditional music, with dancing. 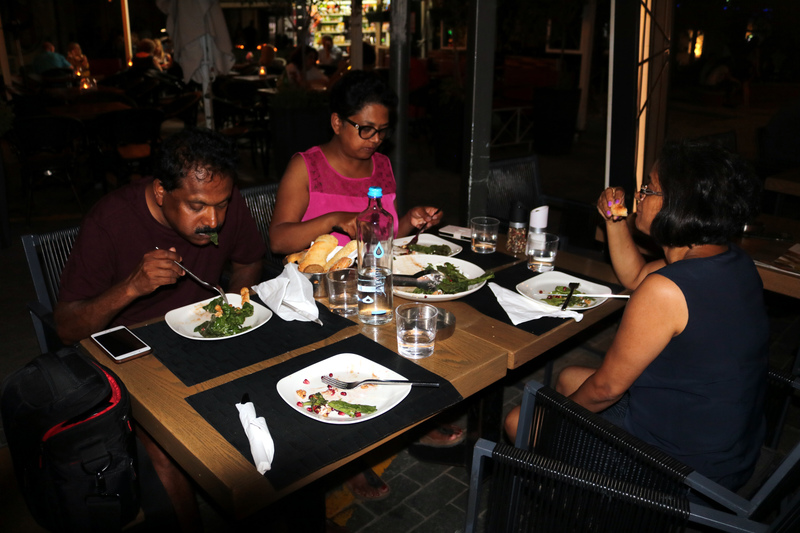 One can enjoy a dinner at the many taverns which offer delicious local Cretan delicacies, local wine and salads. 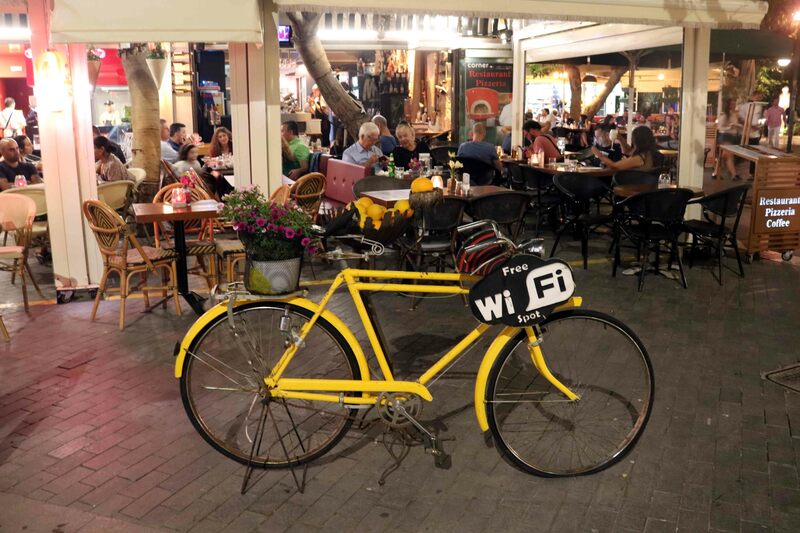 We observed that almost all restaurants had many tables outside, especially after the sunset. Taverns and bars serve traditional local drinks like ‘tsikoudia’ and ‘ouzo’ and special snacks. The beautiful narrow streets with its narrower lanes and by-lanes, are brimming with tourists and locals all through the night. 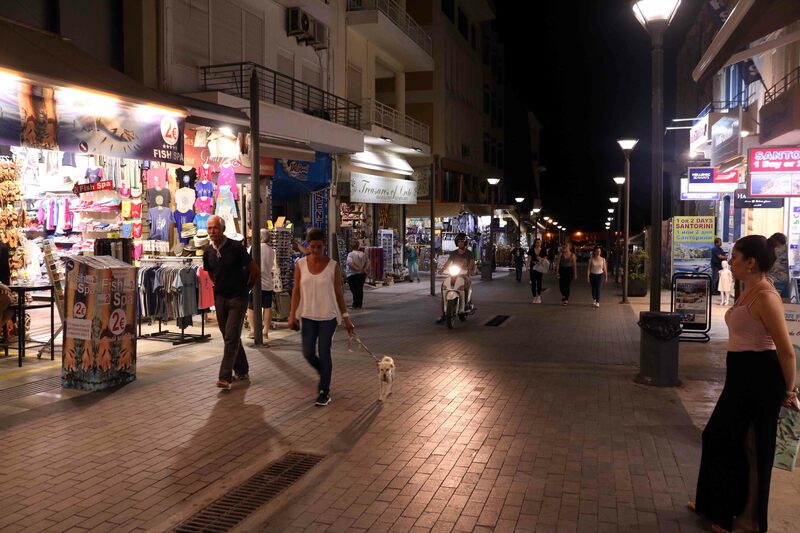 It may well be the most ‘fashion oriented’ city in the Greek islands. Crete has one of the oldest and perhaps the most delicious gastronomic traditions in the world with Cretan olive oil as one of the basic ingredients of Cretan cuisine. Archaeological excavations indicate that the ancient Cretans used to consume almost the same products as the contemporary islanders. Large jars for storing olive oil, cereals, pulses and honey we saw at Knossos palace possibly stand testimony to this tradition. This storage habit would have helped them to survive many sieges the island experienced, mainly by the Arabs, the Venetians and the Ottomans.